Kent County Council (KCC) is intending to oppose plans for a 2nd Gatwick runway, in order to protect residents in west Kent from “intolerable” aircraft noise. A council policy paper sets out the position of the council and gives details of the over-flying problem, and the level of noise which has risen to unacceptable levels. This will be discussed at a cabinet meeting next week. The recommendation states: “The Cabinet agrees that KCC opposes a 2nd runway at Gatwick Airport, opposes the increase in overflights across West Kent as a result of airspace changes, and supports a reduction in the number of night flights.” KCC Leader, Paul Carter, said a potential doubling of the noise impacts over west Kent would be intolerable. The number of night flights at Gatwick during the summer period is already three and half times as many as at Heathrow. “Expansion of night flights must not happen.“ KCC said it will call on Gatwick to put in place operational procedures to provide respite for areas experiencing continuing over-flights day and night, to spread out the noise burden. Changes in Gatwick flight paths have prompted Kent County Council to withdraw its support for a second runway at the West Sussex airport. Council leader Paul Carter said the new flight paths had made life intolerable for people living in the Bidborough, Chiddingstone and Speldhurst areas. The council previously support the second runway in its report, Bold Steps for Aviation, published in May 2012. Gatwick said it regretted the council (KCC) had reversed its decision. The Airports Commission is considering three options for airport expansion in the South East – a second runway at Gatwick, a third runway at Heathrow, or an extension to one of the existing Heathrow runways. KCC’s new policy is expected to be approved by its cabinet on 1 December and submitted to the Airports Commission as part of its three-week consultation. “What has changed big time is that the National Air Traffic Control have started to implement changes in flight paths,” said Mr Carter. Five MPs from Kent, Surrey and Sussex also expressed their concerns about the new flight paths and the second runway, at a meeting in Crawley on Saturday organised by Gatwick Area Conservation Campaign. Gatwick Area Conservation Campaign held a meeting to oppose a second runway attended by five MPs. Alastair McDermid, Gatwick’s airports commission director, said flight path changes had reduced the number of people who were affected by aircraft noise but those under the new routes did have more noise. “There will be no further changes while we look at this and we try to learn would be the best way to implement them,” he said. He said thousands of households affected by noise from a second runway would get £1,000 a year compensation and insulation grants. Gatwick should have approval for additional runway capacity. in Kent County Council opposing a second runway at Gatwick Airport. The increase in over-flight across West Kent, the proposed airspace changes and night flights at Gatwick are also opposed. changes, and supports a reduction in the number of night flights. Kent County Council is intending to oppose plans for a second runway at Gatwick Airport in order to protect residents in west Kent from “intolerable” aircraft noise. A paper published today sets out the position of the council and details how an increase in over-flights and noise experienced by communities in west Kent has risen to unacceptable levels. It comes just two weeks after a major consultation exercise on the future of air transport was launched by the Airports Commission. On the drawing board are two proposals for expansion at Heathrow Airport, and one at Gatwick – which will itself cost an estimated £9.3 billion, £2 billion more than predicted. KCC said it will call on Gatwick Airport to put in place operational procedures to provide respite for those areas that experience continuing over-flights day and night. The matter will be discussed by officers at a cabinet meeting next week, where a recommendation has been put forward for KCC to oppose “a second runway at Gatwick Airport, oppose the increase in overflights across west Kent as a result of airspace changes, and support a reduction a reduction in the number of night flights. Leader of Kent County Council Paul Carter said:“The noise impacts on west Kent from Gatwick’s current single runway configuration are already unacceptable and a potential doubling of these impacts with a second runway would be intolerable. “The National Air Traffic control service has started to implement changes in flight paths, which has brought to our attention two things – a concentration of flight paths over west Kent; and that the number of night flights at Gatwick during the summer period is three and half times those coming in and out of Heathrow, which is a massive issue. Affected residents have reported that overflights have recently risen from 10 – 20 flights-a-day to a maximum of 150. Mr Carter added: “It is quite clear that residents in west Kent are already suffering from significant levels of disturbance as a result of increased air traffic over the last few years and the recent changes in flight paths. “We want Gatwick to provide respite for these residents by varying flight paths – and have met with the airport’s chief executive to discuss this. “We want the NATS air traffic control service to re-design the airspace to include the use of multiple arrival and departure routes, to provide predictable, rotating respite, and spread the burden of over-flight more equitably between communities. “The current number of permitted night flights is simply unacceptable and has resulted in a massive increase in the number of complaints from residents whose quality of life has been disrupted. “Lastly, there is a lack of adequate surface transport infrastructure enhancements to cope with the proposed additional demand and little obvious direct economic benefit to Kent. Many west Kent residents became concerned that their views were not being considered by the county council. At a Southborough Town Council meeting held in September, KCC member Matthew Balfour was questioned by many before stating the council’s support for the second runway was “history”. Richard Streatfeild Chair of the High Weald Councils Aviation Action Group said he welcomes the news that KCC will oppose expansion at Gatwick. He added: “Listening to the leader of KCC one could tell that the impact of hundreds if not thousands of letters and emails that the council had received from individuals, Parish and Town Councils as well as protest groups were key to their change of heart. A paper published today (to be considered at a meeting of the cabinet on 1 December) sets out the position of KCC and details how an increase in over-flights and noise experienced by communities in West Kent has risen to unacceptable levels. The county council will call on Gatwick Airport to put in place operational procedures to provide respite for those areas that experience continuous over-flights day and night. “The noise impacts on West Kent from Gatwick’s current single runway configuration are already unacceptable and a potential doubling of these impacts with a second runway would be intolerable. “In line with the EU Single European Sky initiatives, the National Air Traffic control service has started to implement changes in flight paths, which has brought to our attention two things – a concentration of flight paths over West Kent; and that the number of night flights at Gatwick during the summer period is three and half times those coming in and out of Heathrow, which is a massive issue. Gatwick’s night time air transport movement limits (between 23:20 and 06:00) remains set until 2017, at 3,250 in winter and 11,200 in summer. This contrasts with far tighter night time movement controls at Heathrow – 2,550 in winter and 3,250 in summer. “It is quite clear that residents in West Kent are already suffering from significant levels of disturbance as a result of increased air traffic over the last few years and the recent changes in flight paths,” Paul Carter said. “We want Gatwick to provide respite for these residents by varying flight paths – and have met with the airport’s chief executive to discuss this. We want Gatwick and the NATS air traffic control service to re-design the airspace to include the use of multiple arrival and departure routes, to provide predictable, rotating respite, and spread the burden of over-flight more equitably between communities. “Also, the current number of permitted night flights is simply unacceptable and has resulted in a massive increase in the number of complaints from residents whose quality of life has been disrupted. In 2012 Kent County Council produced a document called “Bold Steps for Aviation” in which it recommended to government the building of a 2nd runway at Gatwick airport (as well as high speed rail between Heathrow and Gatwick). It stated: “Capacity growth at Gatwick through the addition of a second runway after 2019. ” This has infuriated many people in west Kent who are increasingly badly affected by Gatwick, and its aircraft noise in particular. Now KCC’s councillor Matthew Balfour has said publicly that the support of KCC for a Gatwick 2nd runway is “history.” Sir John Stanley, Tonbridge and Malling MP, has sent a letter to Kent Council leader Paul Carter asking him to formally rescind the authority’s support of the 2nd runway. He has not received a reply. 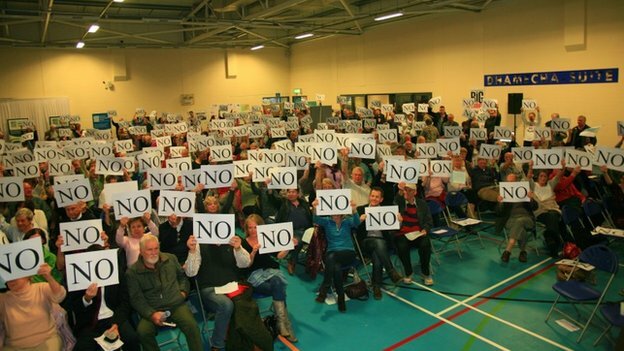 At a public meeting in Southborough, people were directed to the current document on the KCC website (Facing the Aviation Challenge – August 2014) that now states it currently has no preferred option. “KCC gives support in principle to expansion at either airport as the right solution to the UK’s aviation needs” by 2030. Sir John Stanley MP does not feel that this new document is enough. Kent County Council produced a deeply unpopular document called “Bold Steps for Aviation” in May 2012, that backed a 2nd Gatwick runway. This called for: “Capacity growth at Gatwick through the addition of a second runway after 2019. “. Posted: Monday, November 24th, 2014. Filed in News about Airports, Noise News, Recent News.